Well, here in California, another drought year was upon us. We had already cancelled a ski trip the first weekend of January and here we were coming up on ski week and there was still NO SNOW. On Saturday January 25th, I sat at my son's play dress rehearsal and lamented the 74 degree weather and the clear sky. Some big decisions were going to need to happen. As of that sunny day in January, Dodge Ridge, the ski resort affiliated with aforementioned rotten cancellation policy PLR, wasn't even open. I vowed first that if Dodge Ridge didn't open, there was no way I was wasting my time and money twiddling my thumbs at Pinecrest. I'd rather stay home and work. My next vow was that there was no way I was staying home and working, and that if we weren't going to Pinecrest and skiing we were going somewhere else. I dreamed of Mexico or Florida, but my family was intent on skiing--we were going to where the snow was. 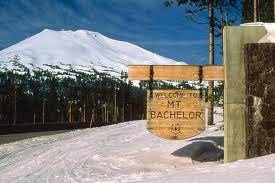 My friend, Julie Mercik, said, "You need to go to Mount Bachelor!" With three weeks until departure, I took out my phone and released my reservation at Pinecrest Lake Resort...come what may. It was time to plan a whole new vacation. On the weekend before we were to depart, Dodge Ridge announced that they would open that week. One week before we left our condo was re-rented and we were let off the financial hook. On February 17th, at five thirty in the morning we began our 8.5 hour journey to Bend, OR. VRBO #201884 is better known as Mount Bachelor Village, Ski House 1, #224. It is an 850 sq ft, 2BR, 2BA condo. There is one king bedroom downstairs, a queen bedroom upstairs, and a sleeper sofa. The kitchen is newly remodeled and well stocked. Everything is clean and modern. The rental comes with access to a community pool (though not operational now) and two hot tubs, which we made sure to visit, a washer and dryer, and free Wi-fi. Renting this unit also entitles you to the ski packages available to unit owners. We purchased lift tickets in advance that allowed us to ski 3 out of 5 days (which came in handy later!) and allowed our children 12 and under to ski for free. We also purchased a 3 out of 5 ticket for out 14 year old. All broken down, this allowed us to ski for under 60$ per day, our teen to ski for under 50$, and our other children to ski for free. BRASS TACKS: So what does this lovely rental cost? Well, keeping in mind that we stayed midweek in what was considered "off peak" time as Oregon schools do not have a ski week, the price in my opinion was a genuine steal at $189 per night. A standard room at Yosemite would cost you this much. This type of accommodation would cost more than $400 in Northstar Village (see my blog complaining about Northstar last year). With a 10% occupancy tax, a 100$ cleaning fee, a 39$ mandatory damage insurance fee, and the lift tickets for three days for the five of us, this portion of our four night vacation was $1461.00, worth every penny, a downright bargain. Because of our fortunate early arrival, we had time to scope around town for the possibility of renting our skis down in Bend and avoiding one more thing to do at the mountain the next morning. Only about one mile from our condo (walking distance really) we happened upon Powder House, which offered us a deal better than on the mountain itself. 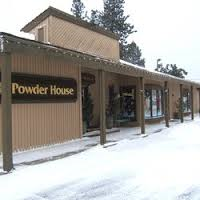 The guys and gals at Powder House were helpful, polite and quick. Even though lots of equipment was being returned after the three day weekend, the five of us were able to get out equipment rented and out of there in about 20 minutes. And it was a good thing too..you should have seen the line for rentals at the mountain the next morning. Renting equipment at Powder House for three days cost $82 for adults, and $54 for children, including my 14 year old that they counted as a child. On the mountain, a 3 out of 5 day rental would have cost and adult $105 and a child $87, and Natalya most certainly would have been counted as an adult. True--if you are really on the ball you can reserve your equipment at the mountain over the internet and save up to 7% bringing your package total to $98 or $81 (non-refundable by the way, and don't forget the line at the mountain), but if you were in our position, the savings were significant. Even when we decided to rent our skis one extra day the price at Powder House, the price was still less than what we would have paid on the mountain for three days, especially after the break we got on Natalya. Bottom Line: Unless you love lines and paying extra, rent your skis in town. This will also cost you less than renting them in the Bay Area and hauling them up to Bend. second largest single mountain resort, second only to Vail, in the United States. It is located 22 miles west of the town of Bend, a drive of about 25 minutes (as mentioned already). The base of the mountain sits at 6300 ft of elevation, a nearly 2700 ft elevation gain from Bend. The short path to the mountain can change from clear, sunny and minimally snow covered in Bend to foggy, white, thoroughly snow covered, and in our case, stormy and windy, at the base of the mountain. In no way does the weather in Bend dictate the weather on Mount Bachelor. 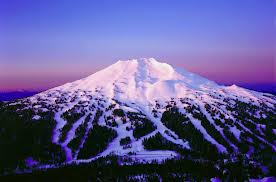 Typical snowfall at Mount Bachelor is more than 350 inches a year with a mid-season base snowpack of 100 inches. Good luck matching that in Tahoe. Mount Bachelor has two lodges, the West Village Lodge and the Sunrise Lodge, at which you can park your car and begin your day of skiing. However, if you ordered tickets online, you are going to have to pick them up at what is called the Nordic Lodge. There is quite a crowd at this area. There is also the Pine Marten Lodge at mid-mountain, which the first day we didn't even realize was there because the conditions were so bad we couldn't see it. There are 88 runs (60% of which is advanced or expert--though don't let that fool you, as many of these can be closed due to weather/wind/snow coverage) and 5 terrain parks. There are 10 chairs (7 express quads and 3 triple chairs--all with safety bars). During the time we were there 6-7 were open, depending again on weather/winds/crowds. The days with bad weather we were able to get on all lifts with no waiting. The day the weather was amazing, we probably would have waited nearly half an hour but we always took the singles line so maybe waited 15 minutes max. Just to give you an idea of how huge this mountain is, the longest run is 1.5 miles! Seriously, I had to give the weather and our experience with the weather its own subheading. The main reason that Mount Bachelor skiing is as good as it is, is because it's COLD and it SNOWS A LOT. So if you are used to sunny balmy days in the 40s while skiing in California, you are in for a new experience, and not necessarily a pleasant one! at the bridge of my nose! I don't mess around when I ski. If I expect cold temperatures I wear 6 layers on top, two on my legs, double gloves, double socks, a scarf that covers my face completely, and goggles, topped off with a fleece hat and the hood to my jacket. Had a not been wearing such a formidable suit of armor, I can probably safely say I would not have survived the conditions that faced us at Mount Bachelor. Your first wind blast is opening the door to your car in the parking lot, and it just gets worse from there. As you crest each ridge while on the chair lift, some worse than others, but all pretty bad, 40 mph winds carrying snow both falling and being swept off the trees, pummel you and your poor little chair. As elevation gains, the blanket of fog appears, and now you can't see either. You just put your hands in fists and your head down and silently pray. Thank God for the high speed quad. We rode the Rainbow Chair once quite by accident and its slow speeds nearly flash froze us. ﻿But the chair may not be the worst. Now you have to ski through the treacherous fog and wind you were previously just riding though. With me in front and Craig in the back, our single file slow moving line meandered through the white--white sky, white air, white ground--slowing periodically to scrape off the ice forming on our goggles.However, once off the top, about 100 yards, though still snowing, the visibility improves and it is evident that this is perhaps the best snow you have ever experienced, and when you hit the bottom of the hill, something makes you want to brave it again, and again, and again, which we did until 4pm that afternoon. The next morning it was snowing in BEND--not a good sign! After not too much deliberation we decided not to ski but rather to ski on Friday, despite the fact we were going to have to rent our skis another day and we had no place to stay after skiing Friday night. Better weather was forecasted for Friday, and anything was better than three days in a row of arctic torment. SO, off we went to the COLUMBIA OUTLET! What a godsend! For some reason they were having a ridiculous sale. Craig and I turned in our ancient Costco ski gloves for two $80 pairs marked to $19.99 each. Ally got a new hat and a new ski jacket. The whole bill? Like $120! Another too snowy on the mountain but great weather in Bend activity was the Deschutes Brewery tour. Their free 45 minute tour includes four four ounce samples of their fine offerings for the adults and root beer for the kids. The tasting room is a fun atmosphere with helpful and friendly staff. We were hooked! My favorites--the Inversion IPA and the Hop Henge Ale--looking all over for these in California. If anyone sees it, please grab me some! and they actually believed me! But Friday...oh Friday. On Friday we saw Mount Bachelor for the first time. By mid morning the sun had burned away the clouds, revealing a winter paradise like no other, a witness to what three days of winter pounding had wrought. The trees were so heavily covered, they were more like spires, some so buried, they were more like tufts. The scene was a photographer's dream, the kind of day they wait for for years so they can get shots good enough to put on the brochure. And oh the snow! It was still quite cold (no change in my above mentioned attire) so the powder that had fallen stayed dry and soft. Many locals told us that we were there on the best day of skiing to date that season. What a blessing! Runs closed all week due to wind and weather were open and we took advantage! Though our legs said no, we willed ourselves to make it happen! We skied a third day all the way until four! Though the lofty plan was to drive home after leaving Bend at 5:30, we didn't make it. After 5 hours we stopped at a Holiday Inn Express in Red Bluff and spent the night. Dodge Ridge or Mount Bachelor next February?? Thursday night we sat in the hot tub after another icy day of skiing, sipping our Inversion IPA, and discussed this very question. The reviews were mixed. I said Mount Bachelor because of a better mountain, better and cheaper accommodations, and no sales tax, but I was reminded about the very long drive and the days with the icicles hanging from my hair. Hmmm. Who knows where we will ski next year!? Thank you for reading this post! Now I'm not going anywhere for a while! Stand by for upcoming posts about California League Opening Day and tips on planning a Hawaiian vacation!